While most think of Côtes du Rhône as a vast appellation producing plenty of relatively inexpensive, everyday wines, we found much to like with this tasting of 2009 reds. Our top wines were certainly more robust and interesting than everyday wines, confirming that in the best years, from the best producers, Côtes du Rhône reds can approach the quality of their more prestigious neighbors, and for much more reasonable prices. Based largely on Grenache, these also usually include Syrah and Mourvedre, but can contain Carignan and other grapes in different proportions. We had difficulty in picking the ranking of the top wines, in this case an indicator of how well-made our favorites were. Indeed, the top four wines were only separated by 5 points - this was splitting hairs. The first, second, and fourth places wines were also recent davidjohnhansen.com wine recommendations. Thanks to Lisa and Jeff for providing their wines, opinions, and very enjoyable anecdotes. 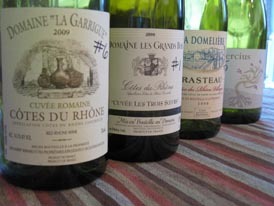 First Place: Domaine La Garrigue Côtes du Rhône Cuvée Romaine 2009. Big plum notes on the nose, but also nutmeg, maraschino cherries, ammonia, acetone, and band aid. Jeff noted "cat box". Soft and overtly fruity in the mouth, and very round in texture. Andy noted, "I taste the barrel a bit", with Ali adding "Barrel party fun". Dark and comforting, like the taste of a braise. Lisa, Jeff, and Andy's favorite of the night. Received 24 points. David's bottle. About $16. Second Place: Domaine les Grandes Bois Côtes du Rhône Cuvée Les Trois Soeurs 2009. Smokey, complex aromatics, that include bread dough, bacon fat, plums, wet stone, vegetation, raisins, cloves, and a woodsy note. Powerful, with plenty of tannin, and a nice arc of flavor, including nutmeg, black pepper, charred wood/meat, scorched earth, and prunes. Lisa felt that is was "very assertive", and that "it slaps you, but you enjoy it". Kristin and Ali's favorite. Received 22 points. Andy's bottle. About $25. Third Place: Cave De Rasteau La Domelière Côtes du Rhône Villages Rasteau 2009. Smelled of soap, stones, brighter fruit, perfume, butterscotch, and some funky notes. Andy found "grass stain". Starts out watery on the palate, but then picks up steam, with ink, granny smith apple, and celery flavors. A classic style. Everyone gave this at least 3 points. Received 20 total points. Ali's bottle. About $14. Michel Gassier Côtes du Rhône Villages Cercius 2009. Metallic scents, along with red bell pepper, sausage, blueberry, pine scented cleanser, and eucalyptus. Ali noted "funked dairy". Sharp on mid-palate, with overt fruit, cloves, and chocolate on finish. David's favorite of the night. Received 19 points. Lisa's bottle. About $15. Domaine de Durban Beaumes-de-Venise 2009. Dark spices, cloves, black pepper, cranberry, fresh dust, metal, violets, and vanilla on the nose. Pleasant and smooth in the mouth, with cola, burnt marshmallow, prunes, and bitter chocolate flavors. Espresso on finish, with some nice teeth-coating tannins. Received 5 points. Jeff's bottle. About $22. Louis Bernard Côtes du Rhône 2009. Smelled dusty, moldy, and foul, with cinnamon, perspiration, used book store, leather, pomegranate, rose petal, and plastic toy notes. Andy noted "awkward teenager". Diluted and watery, with no structure. Rotten apples on finish, along with fish tank water. No points. Kristin's bottle. About $11.